Earlier this week we introduced you to one of the most important methods to our madness when it comes to selecting and delivering great coffee: our weekly cupping. You can review that post HERE. As you’ll recall, we were exploring a recent cupping in which we needed to select a new Brazilian component for our espresso. Let’s pick up back up with the details of the cupping process. In this post, we’ll look at the first phase: smelling. Cupping begins with a weighing out of our samples. These have either been pulled during the week’s production roasts or sample roasted specifically for the cupping table- as is the case with our selection of Brazils. For our recent purposes we had our four main production coffees along with a set of five Brazilian coffees to compare. After weighing our samples and preparing the table with everything we need, the work begins in earnest with grinding the beans. After our samples are ground, we take a moment to experience the dry fragrance of each coffee- moving around the cupping table to smell each coffee fresh out of the grinder. This gives us an initial idea of what kind of natural aromatic compounds we might expect to see in the cup. Coffee- like other beverages such as beer, wine or bourbon- is an intensely aromatic experience. In fact, much of the flavor comes from what you get in your nose. When you pick up a glass of red wine, you intentionally stick your nose in the deep, wide glass to catch its fruity or spicy aromas. Likewise, with a good bourbon, the smell of the barrel comes out as you put your nose to the glass. These aromas are a major part of the tasting experience. Conversely- try beer from a bottle or coffee with a lid on the cup and you’ll get some idea why the olfactory sense is so important. Really, the first thing you usually notice in a coffee shop is that smell of freshly ground coffee. We go for coffees that intensify that sensation. Next step - after the coffee is ground and before it sits for too long (it loses quality quickly once ground)- is to pour water over each cup. Thus begins the process of extraction in which the hot water is quickly pulling solids from the coffees, drawing out all of the possible flavors- both good and bad- from the grounds. 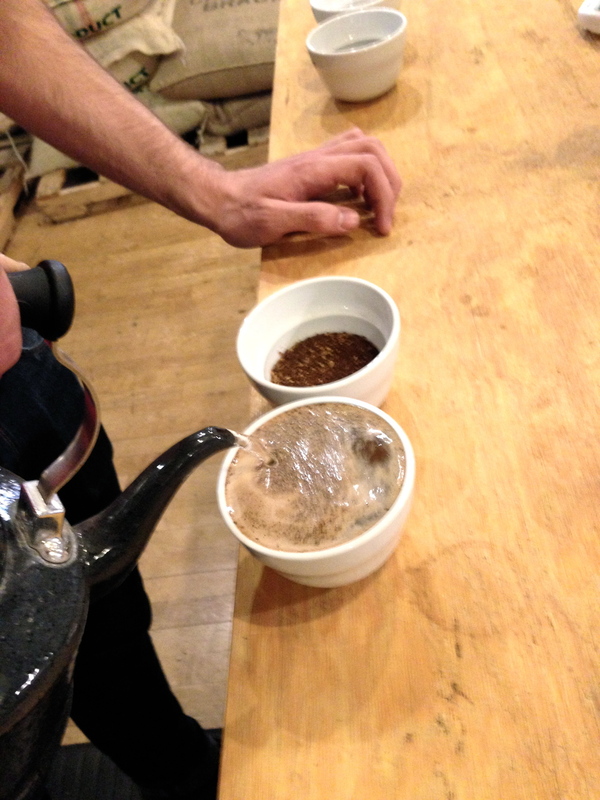 Once each cup is brewing, we’ll take a quick pass to get an initial experience of the wet aroma of each cup. The real aromatic experience, however, comes after about four minutes of brew time. After about four minutes the coffees have sat just about the right length of time for the ideal amount of extraction. Now we “break the crust” that has settled on the top of each cup. When we do this, all of the aromatic gases that have been trapped beneath the crust are unleashed, creating an explosion of aromas that gives us yet another picture of what the coffee has to offer. It’s always especially interesting to see the differences that manifest between the dry fragrance vs. the wet aroma. Did the fruity fragrance hold up in brewing? Did those especially bright, tangy notes disappear or are they enhanced? What unique aspects of this coffee’s origin, territory, processing, and roast are coming through in the cup? Do we smell any noticeably off-putting aromas? All of these questions are a standard part of our cupping-table conversations. These conversations will carry through into our discussion as we begin tasting as well. We’ll take you there in our next post.